Hello We R friends, and Happy Monday! 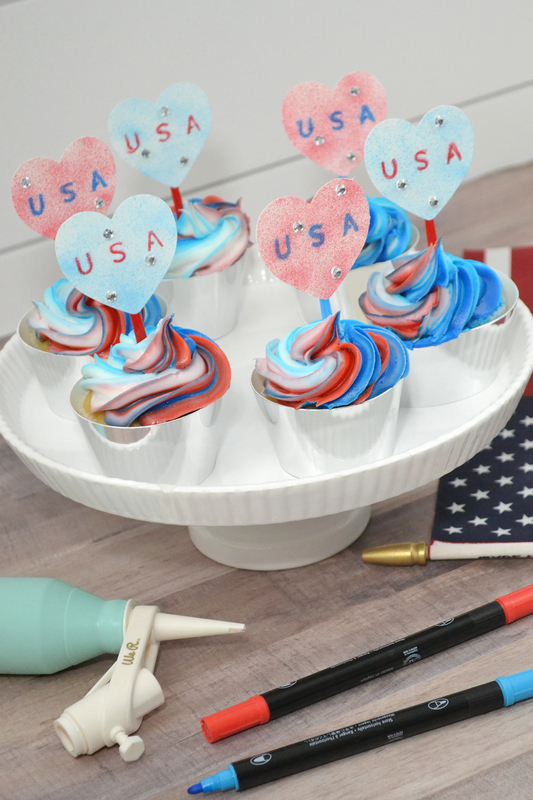 It’s Aly here, and this week on the blog we’re featuring patriotic projects from our design team to inspire your 4th of July crafting. 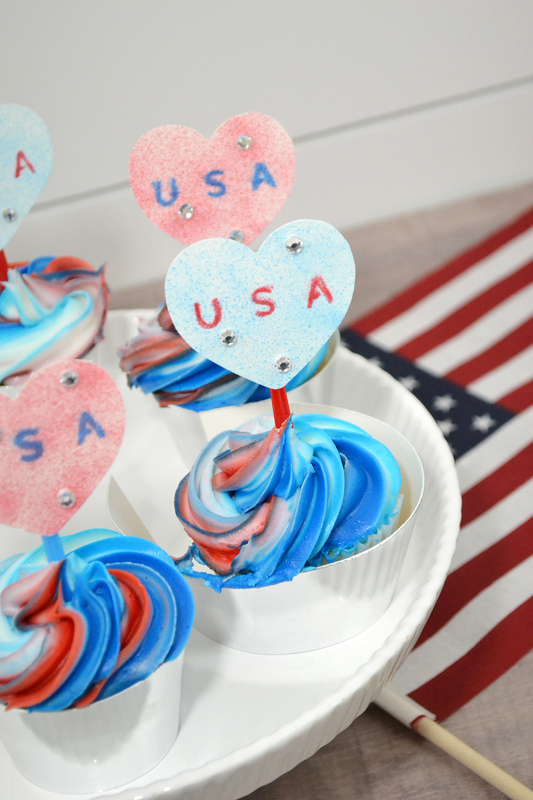 If you’ve got a barbeque, party or other patriotic event, then be sure to check back each day this week for some fabulous ideas! 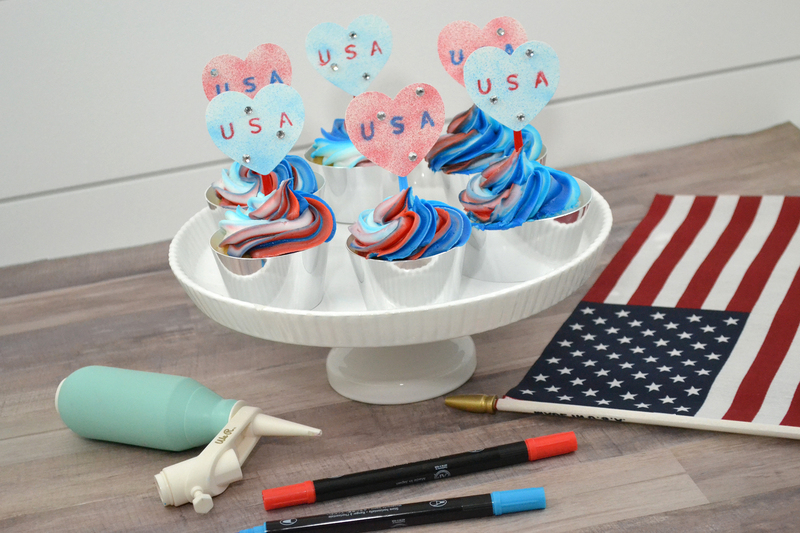 Today I’m sharing a festive cake topper idea for an Independence Day party. 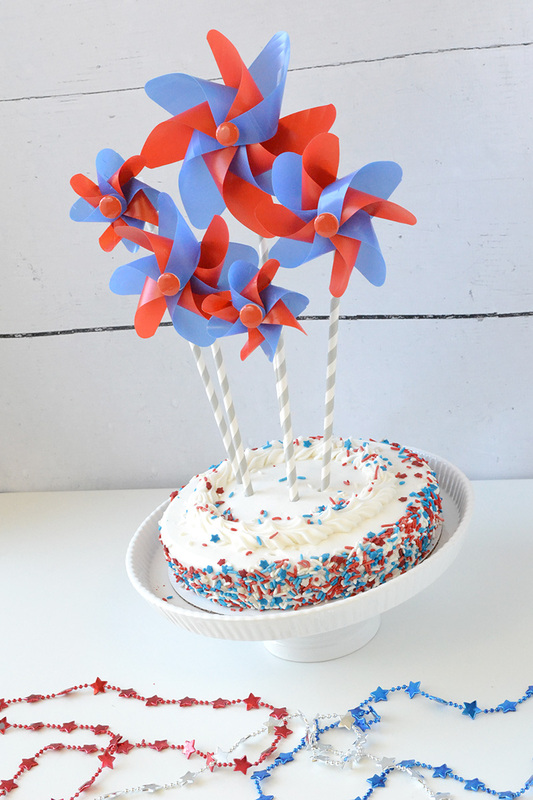 To make this cake topper, I pulled out an oldie but goodie, the Pinwheel Punch Board. 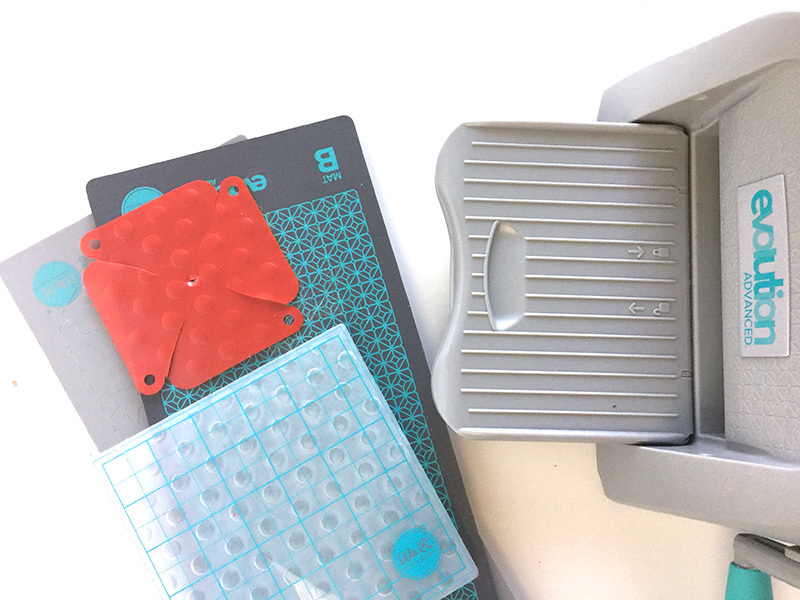 For extra dimension, I made the pinwheels out of Bazzill Basics Plastic Embossing Sheets and embossed them with some Next Level Embossing Folders, and the Evolution Advanced. 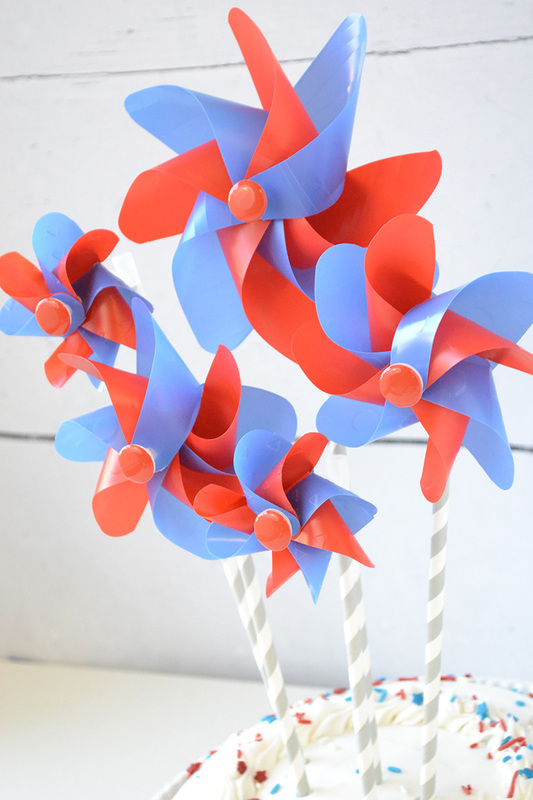 I used the Pinwheel Attachments so that the pinwheels can actually spin, adding a fun interactive element to the cake topper. 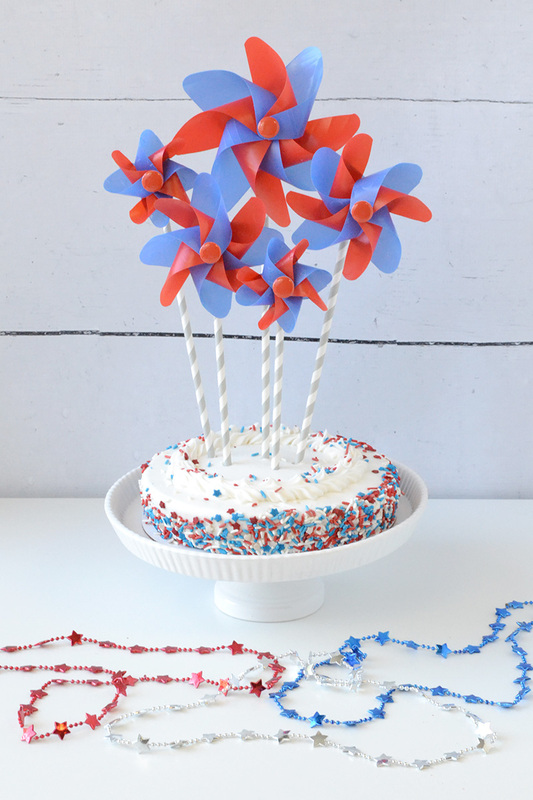 To make this Patriotic Pinwheel Cake Topper, I started by gathering my supplies. I trimmed two red and two blue 3×3 squares, two red and two blue 4×4 squares, and one red and one blue 5×5 square. I punched each corner as explained in the instructions, and then cut all the red squares using the Pinwheel A track. Then I punched the corners of each blue square, and cut them using the Pinwheel B track. 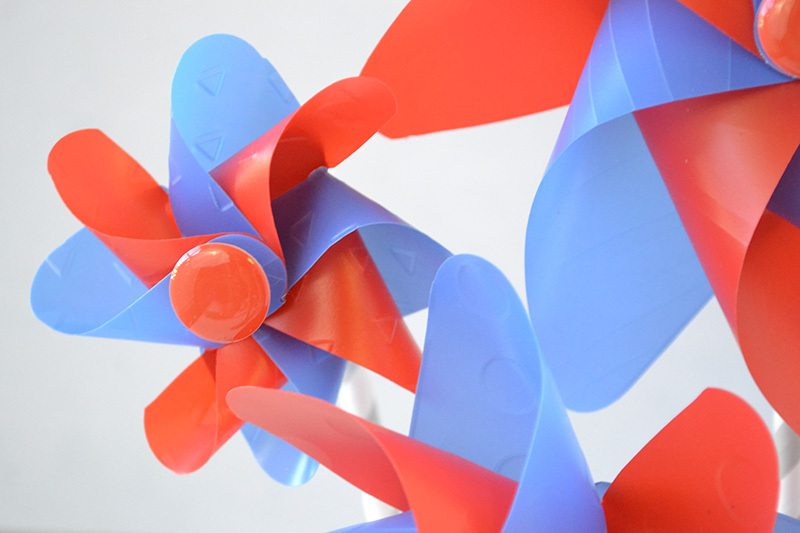 Then I embossed each pinwheel using some Next Level Embossing Folders and my Evolution Advanced. 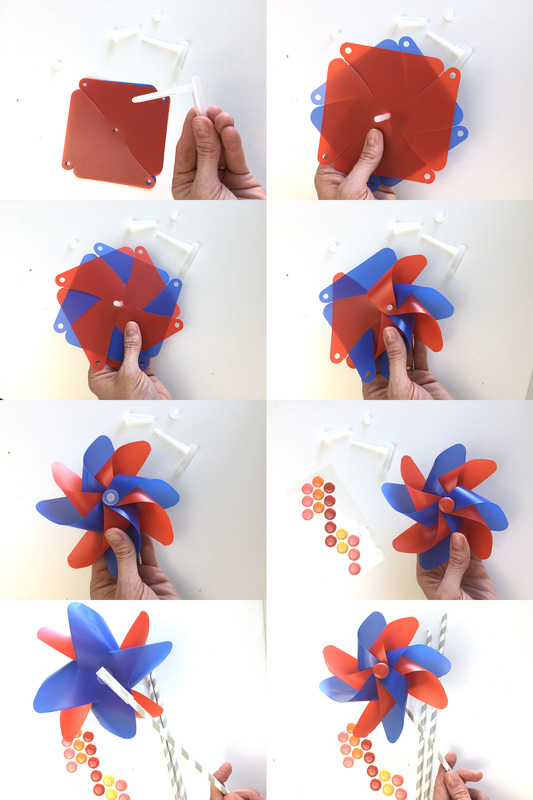 I layered the red squares on top of the blue squares, interlocking the pinwheel arms, and then followed the instructions to assemble the attachment pieces. Once assembled, I added an Enamel Dot to the attachment cap for a finished look and placed a paper straw into the attachment base. I trimmed off the ends of the paper straws at different lengths for a layered look, and inserted them into the center of the cake. I hope this fun cake topper inspires you. 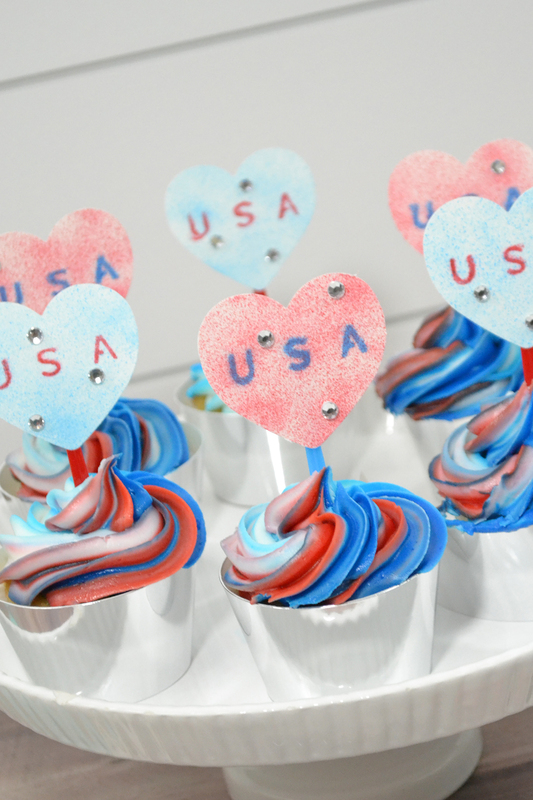 Thanks for joining me today, and be sure to come back tomorrow for some more red, white, and blue project ideas! GO BIG with the Template Studio! Hello We R Fans! 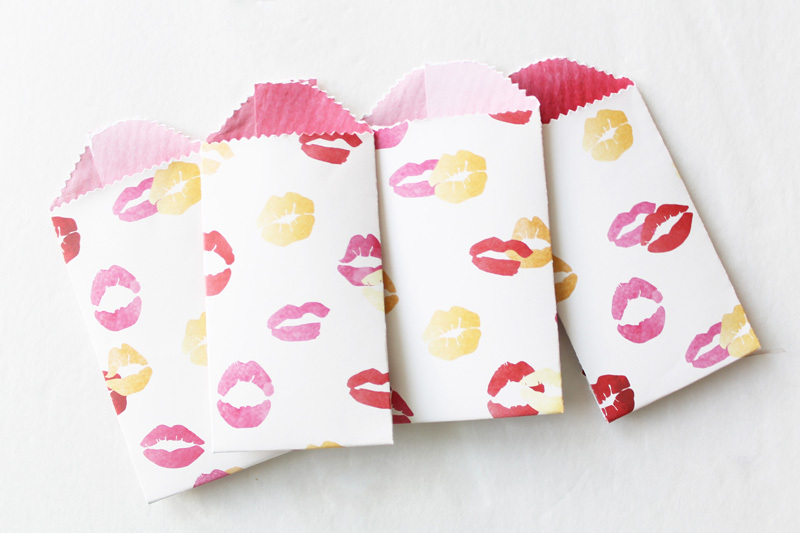 Kimberly here with a fun project perfect for Valentine’s Day! When I was teaching years ago, I would always have my students make foam fortune cookies for a fun project at Valentine’s Day. 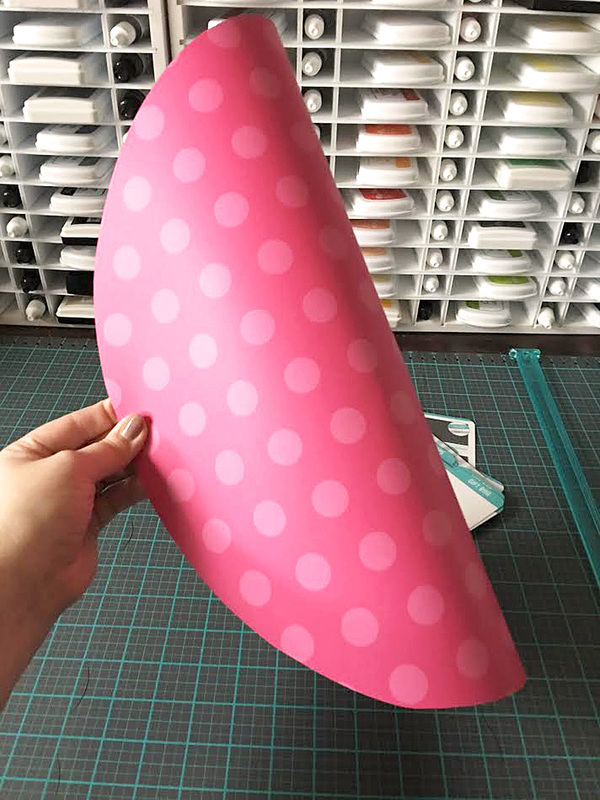 While I have made the cookies in the past look great with patterned paper, I thought, why not take it up a notch and make huge fortune cookies!?! These cookies were a snap to make with the We R Memory Keepers Template Studio and Circle Template. To make them large, I used 22×28 Designer Poster Board in different colors. 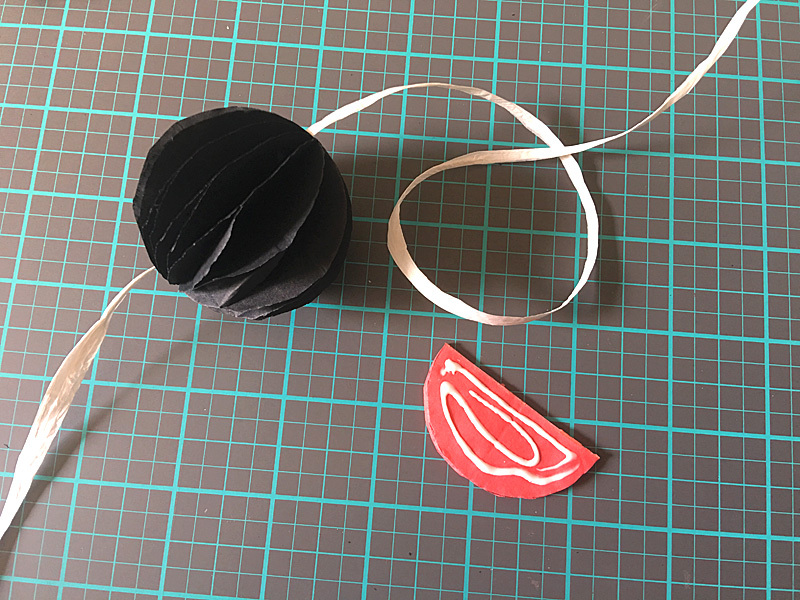 After trimming the paper to size, according to the instructions included with the Circle Template Guide, I cut the circle out using the guide and blade. 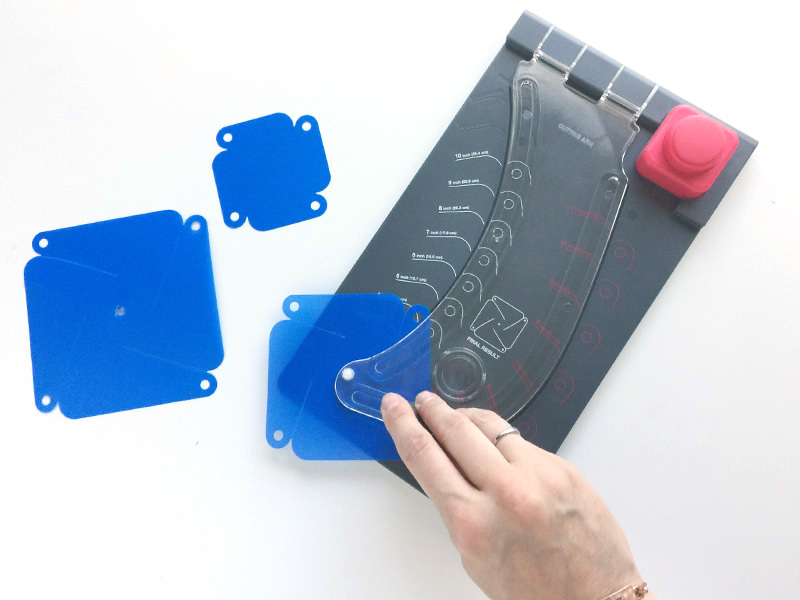 The instructions come on convenient cards that can be kept together with a loose-leaf ring, making it simple to create your shapes. 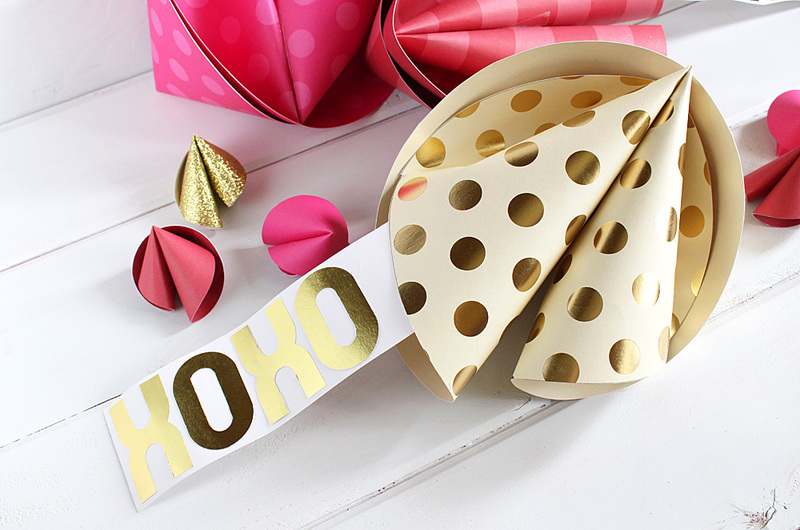 Tip: Roll and create waves with your circle of paper before attempting to create the cookie. This will get the fibers in the paper loosened. 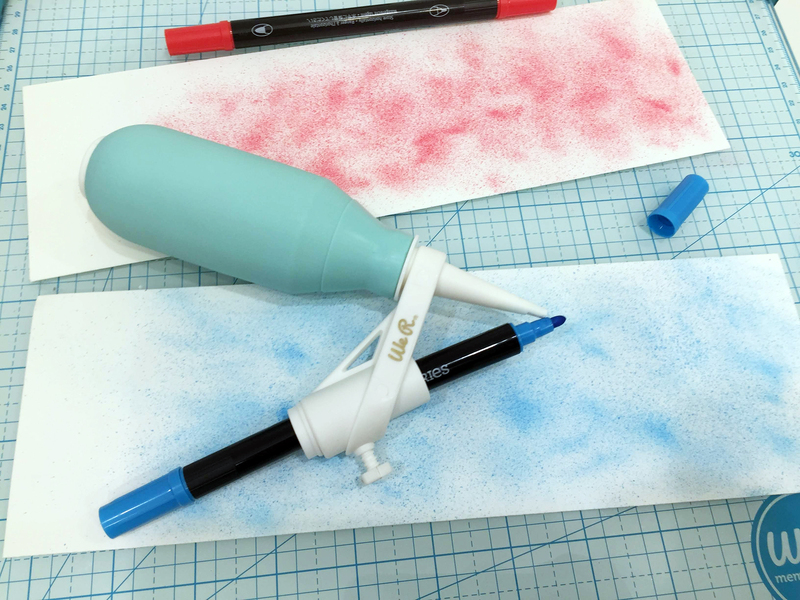 Doing this will allow the paper to bend more easily during the next steps. Fold the paper in half, as shown, but do not crease. Using your hand, create a dent in the center of the “fold.” Having the dent off-center will make the cookie look more realistic. I found that placing the edges of the circle between my knees made it easier to hold onto when creating the dent. 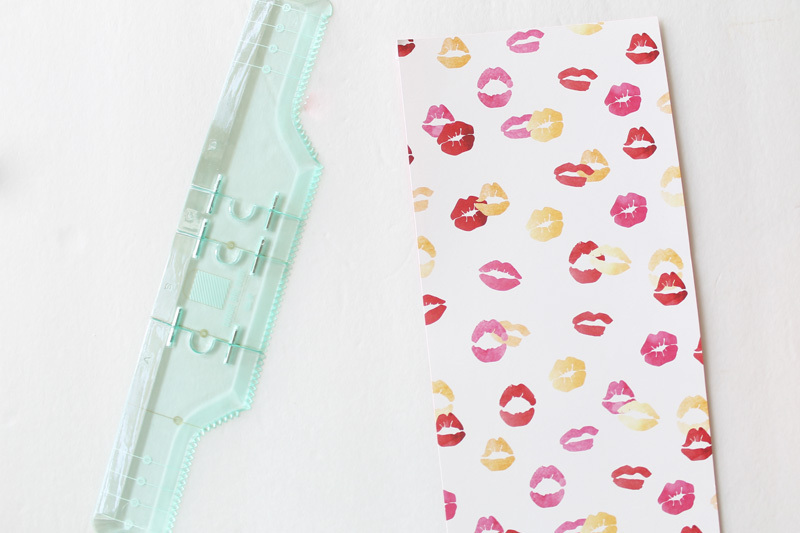 Touch the two outside ends together and adhere with a hot glue gun. Other liquid glues and dry adhesives will not keep the sides together. 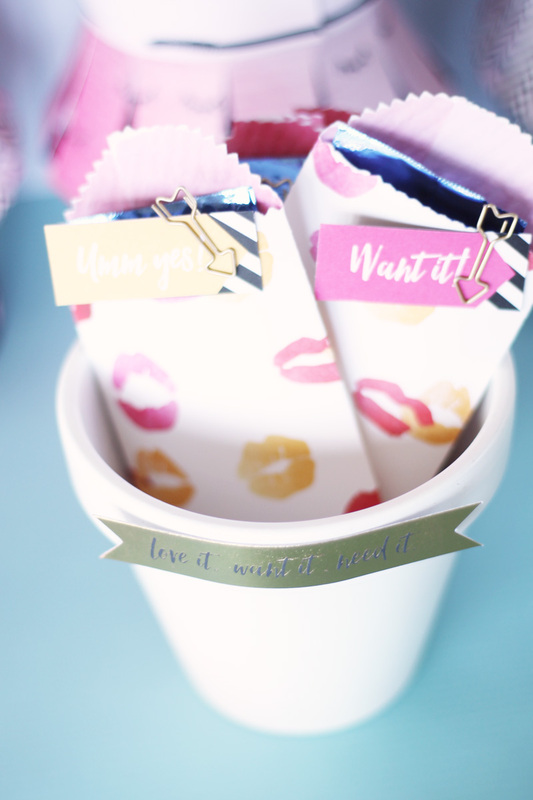 To create the fortunes, the Mini Alphabet Punched help me create love phrases. I adhered the letters to strips of white cardstock. After determining how far out the fortunes needed to stick, I adhered the strip to the outer edge of the fortune cookie. Anyone else feeling lucky in love this Valentine’s Day? 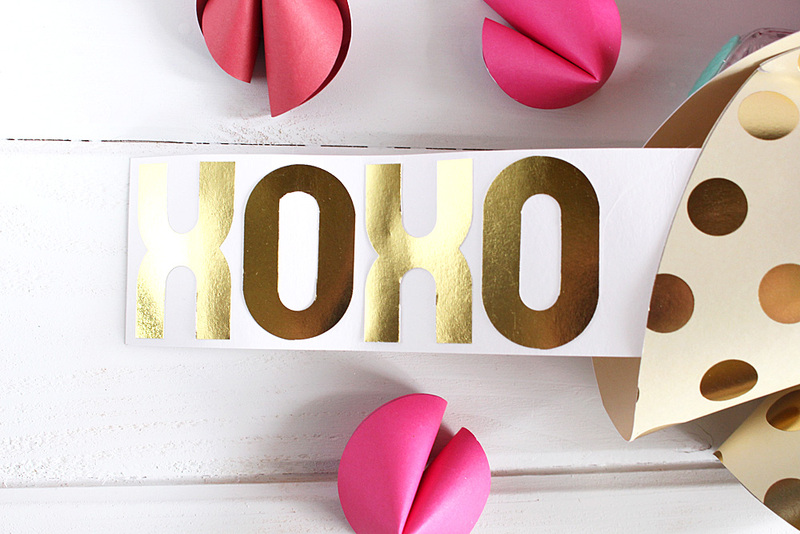 How you would use your fortune cookies? Hello, We R Memory Keeper fans, Laura here. The holidays are the perfect time to share a special little treat with the ones you love. 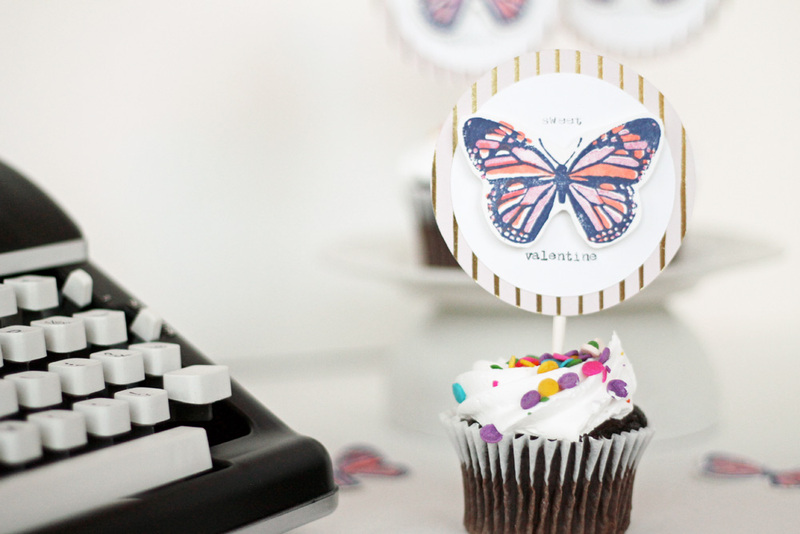 Today, I am going to show you how to make these fun sweet Valentine cupcake toppers using the new Precision Press and the Typecast typewriter. 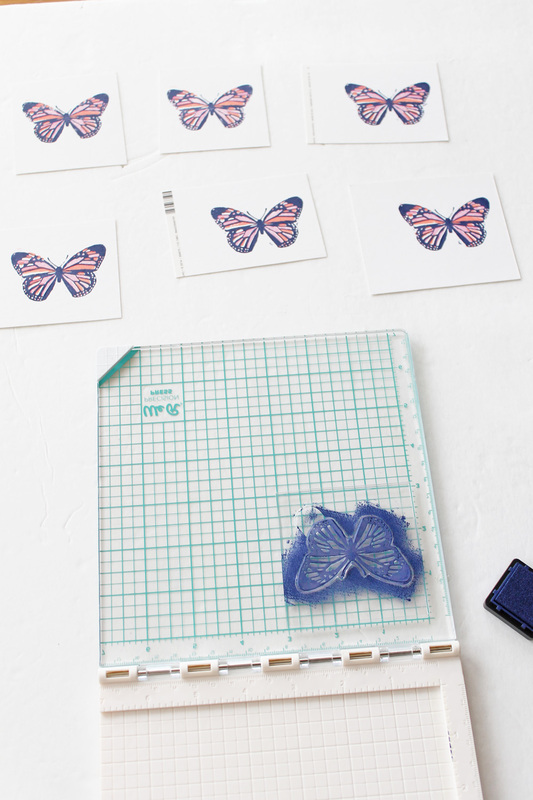 I started with the butterfly stamp set. Line up the guide on the precision press. I aligned mine in the upper right corner. 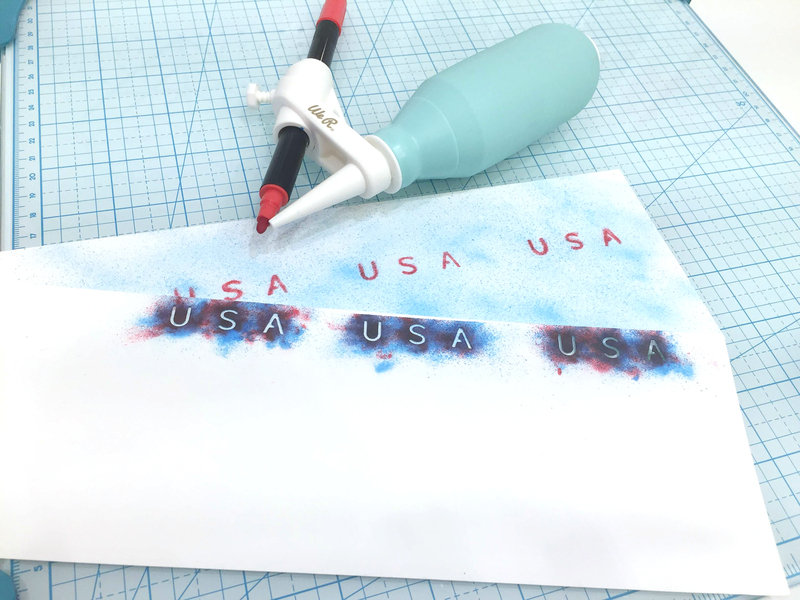 This way I could add my paper flush along the edges of the lower guide to do multiple stamp designs with ease. I created multiples of the same design. I aligned a square of white cardstock in the corner. 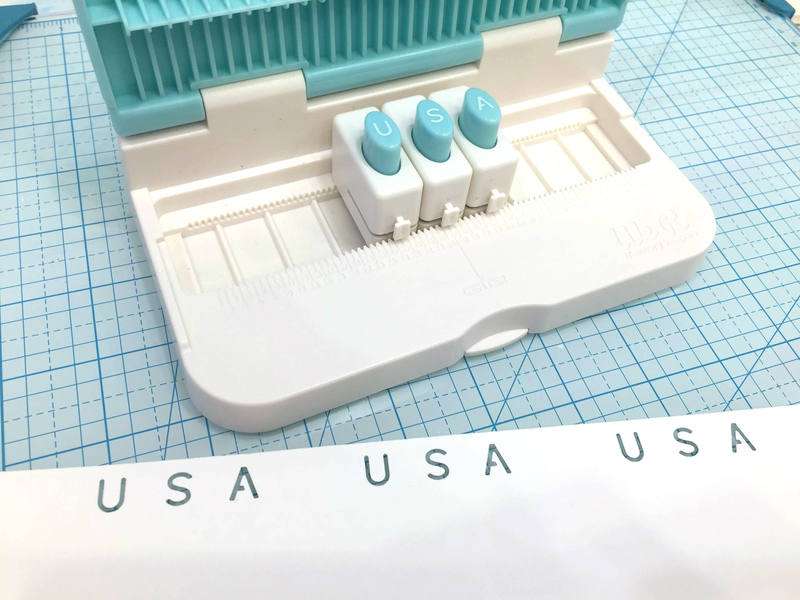 I started using the peach colored stamp pad with stamp number one.I repeated this process on several sheets of plain white cardstock. In between stamps, I wiped off the guide with a baby wipe and dried with a cloth. 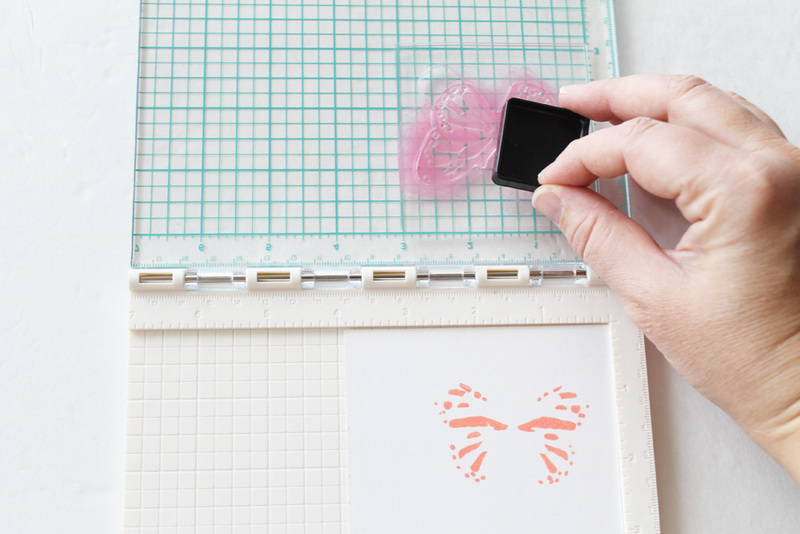 Then, I used the pink stamp pad with the second stamp. Again, I did all my butterflies with stamp two before moving on. 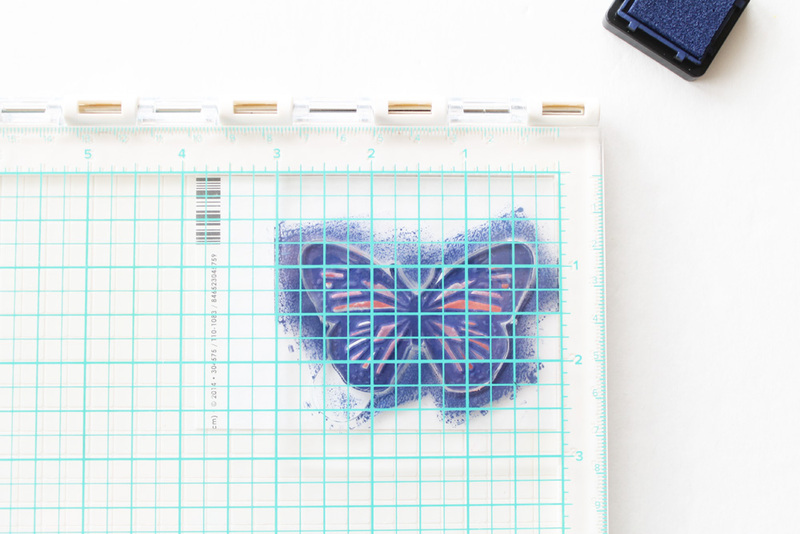 Lastly, I used the navy stamp pad and stamp three to create the outline of the butterfly. Then, I allowed all the stamped images to dry. 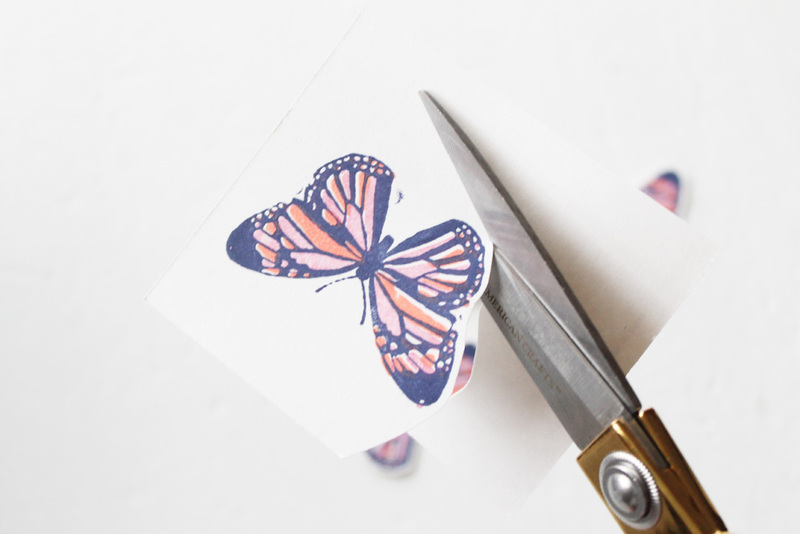 Once they were completely dry, I cut around the edges of each butterfly leaving a small white border around each one. 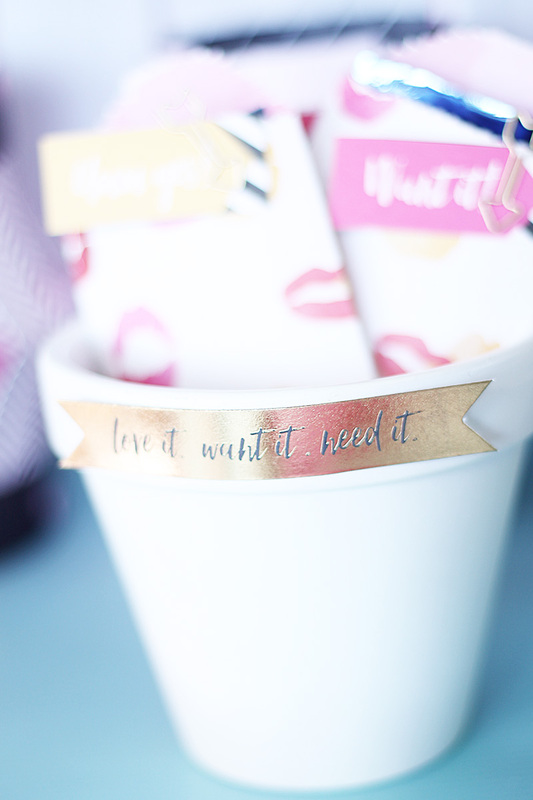 I used more white cardstock and the Typecast typewriter to stamp the words “sweet valentine” on the cardstock. I love how the typewriter gives my toppers a vintage feel. 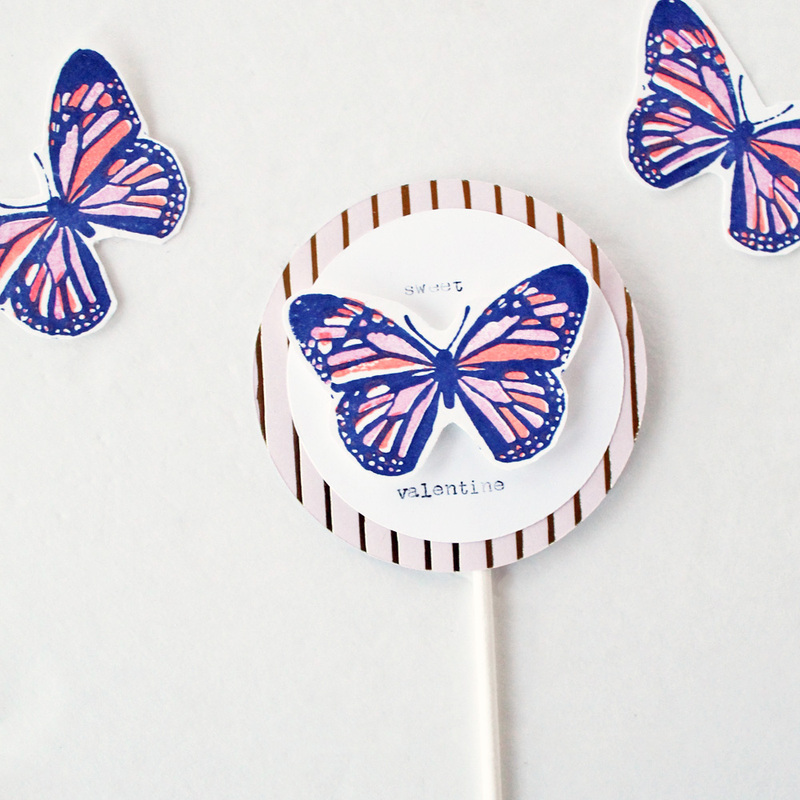 I cut circles around the words to create a background for my butterfly stamped images. 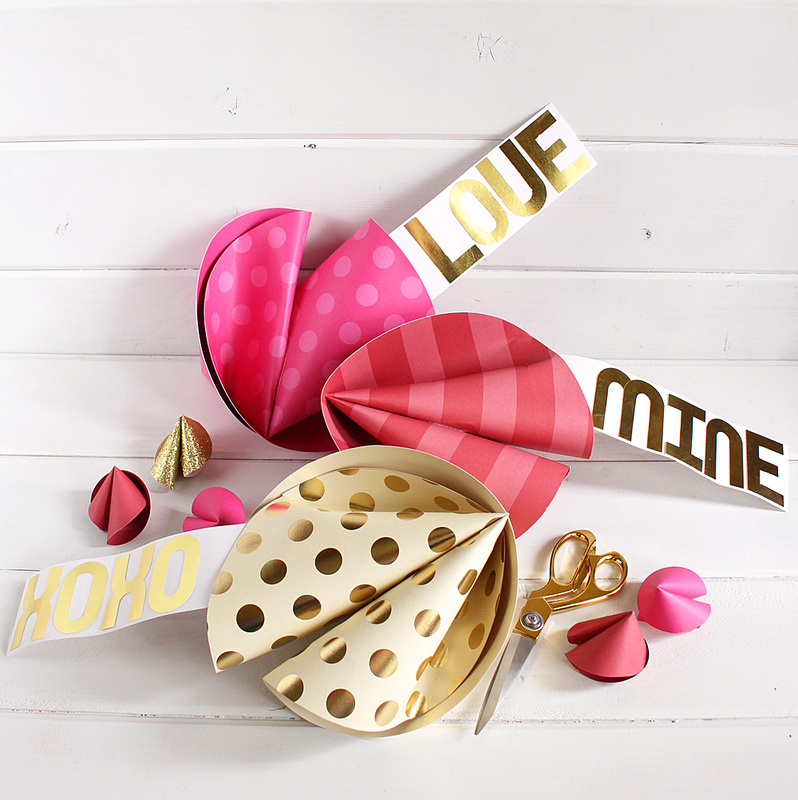 I also cut out circles from this beautiful pink and gold striped paper from the Typecast collection. 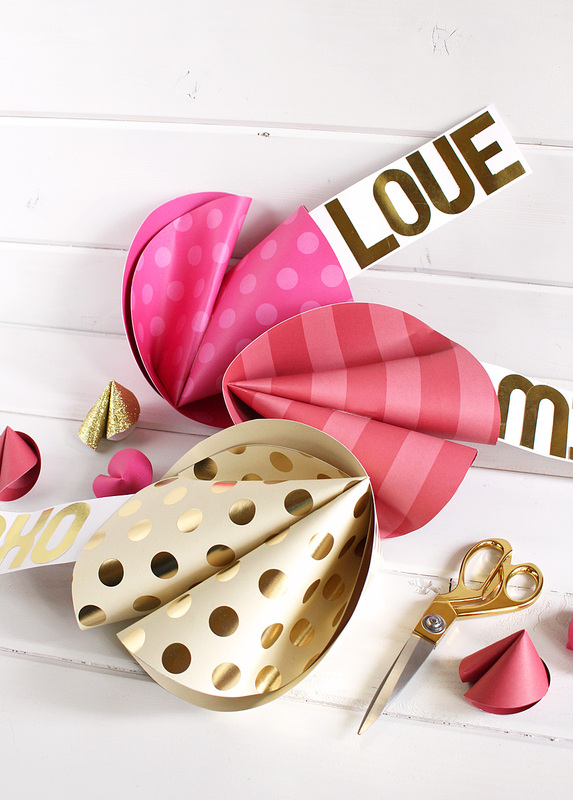 To assemble my cupcake toppers, I started by adhering the white typed circle to the pink and gold paper using my sticky thumb adhesive. 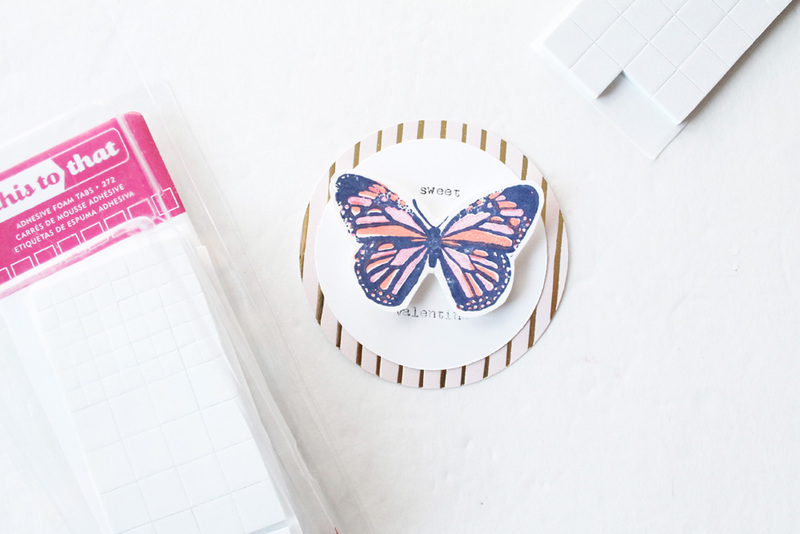 Then, I added an adhesive foam square to the back of the butterfly to attach it to the circles. 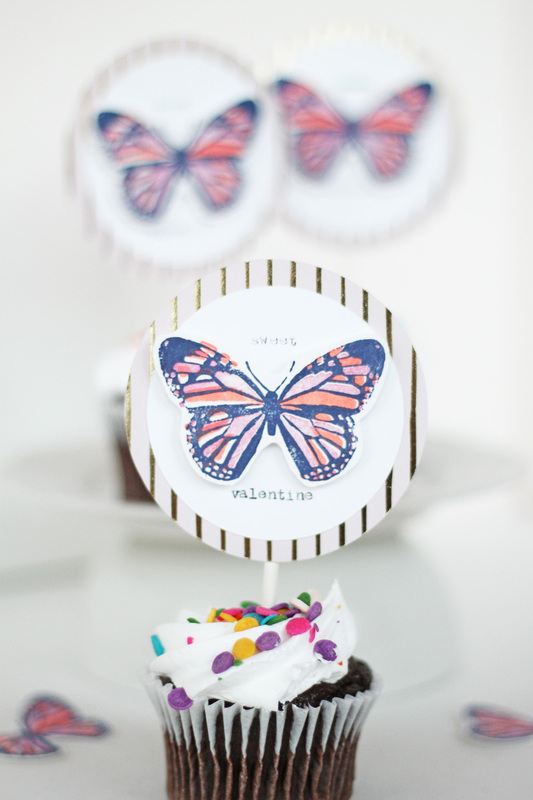 I used a strip of washi tape to attach my lollipop sticks to the back of the cupcake toppers. This is the perfect way to share a ‘sweet’ treat with your ‘sweet’ valentine, this Valentine’s Day. 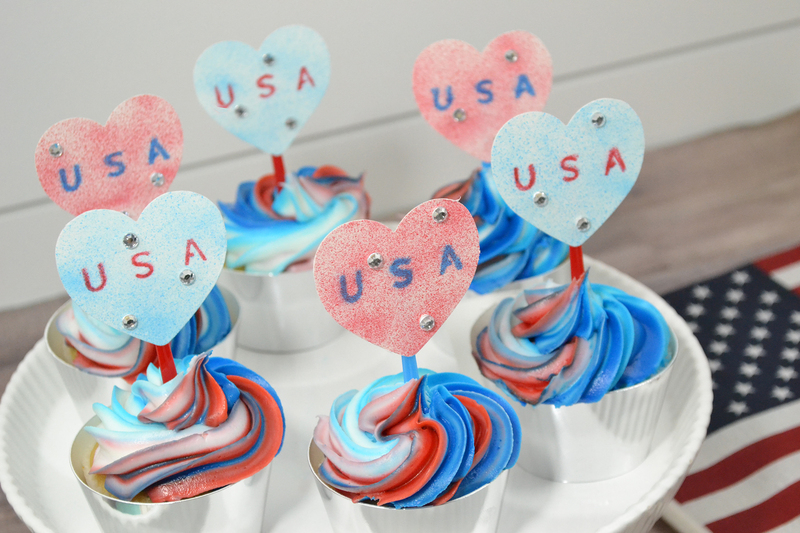 These would be really adorable to make for a class party. 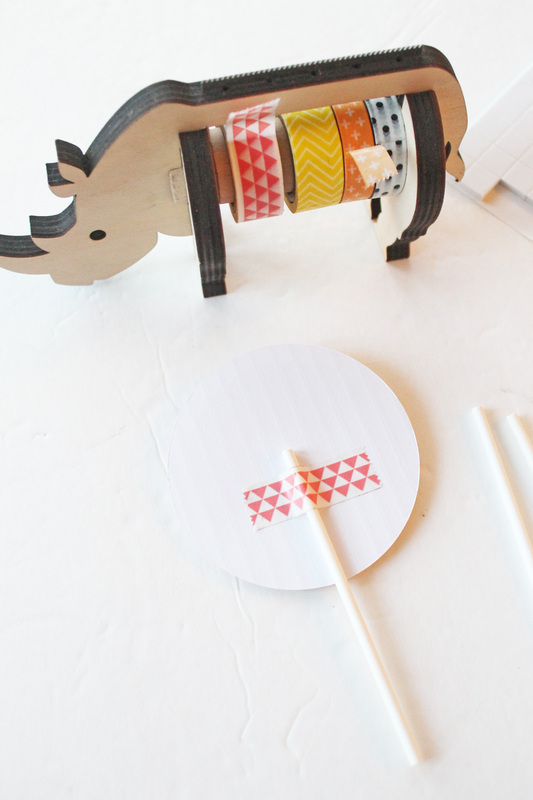 And you could even use them without the lollipop sticks as a fun gift tag. 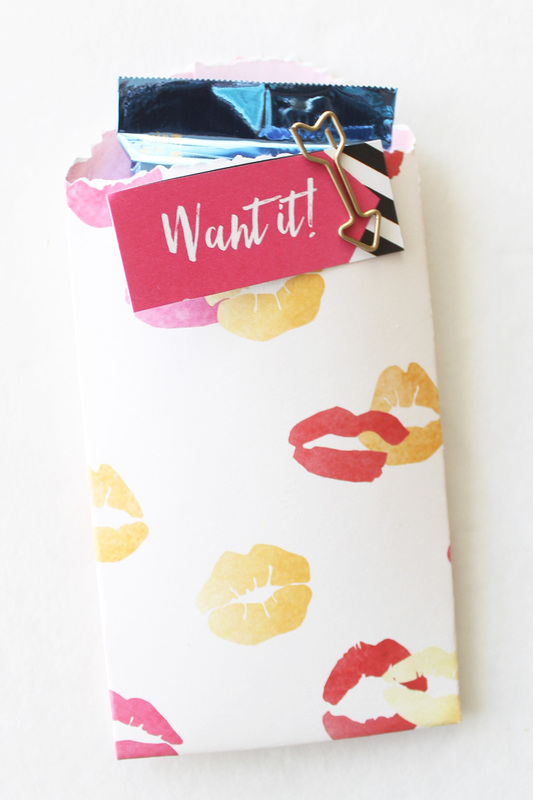 Using the DIY Party Rosette Punch, I made several rosettes from Urban Chic patterned papers, We R Memory Keepers cardstock, and Bazzill cardstock and foil papers. To make the rosettes you see here, you will need two sheets of each paper. Cut each 12×12 sheet in half (6” x 12”). 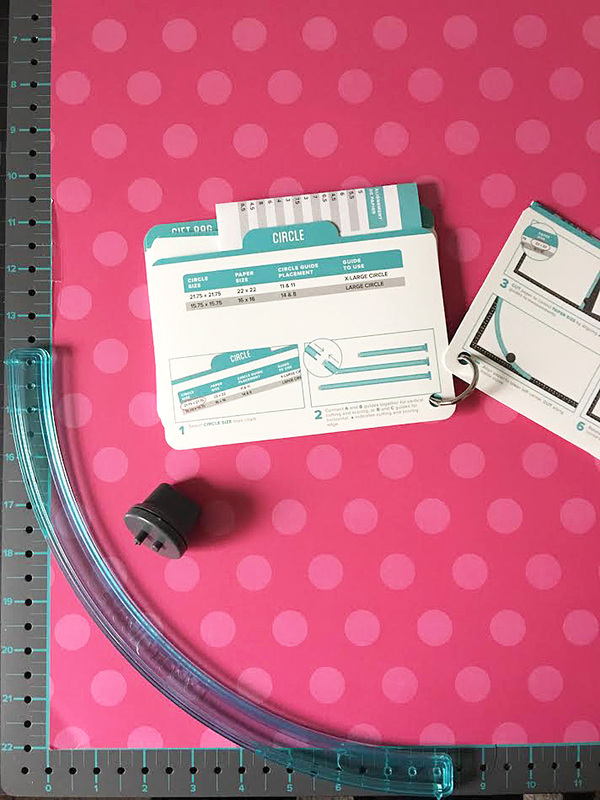 Score three halves at 0.5” increments and use the rosette punch to add the detailed edge. 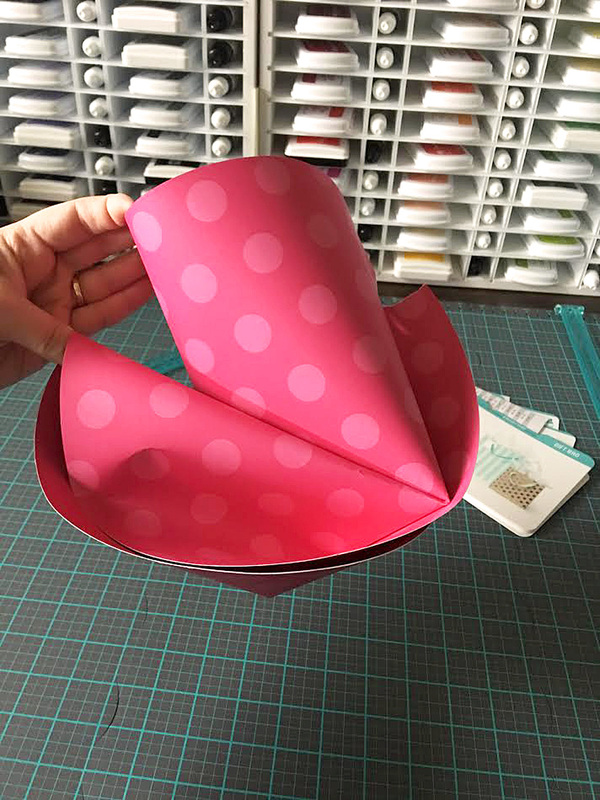 Fold and attach the three 6” x 12” pieces together to form the rosette. For the smaller rosettes, cut the last 6” x 12” piece in half again (3” x 12”). 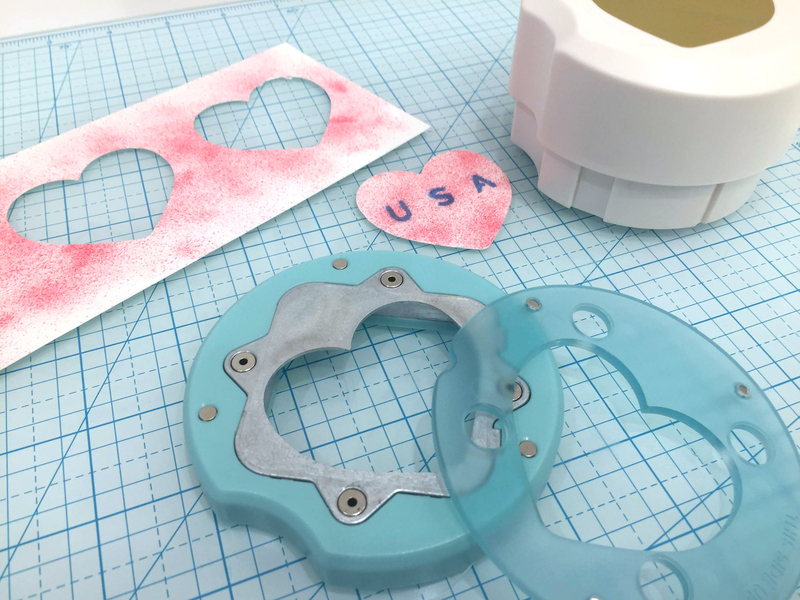 Score the two pieces at 0.5” intervals, use the rosette punch to create the decorative edge, then secure together to form a rosette. 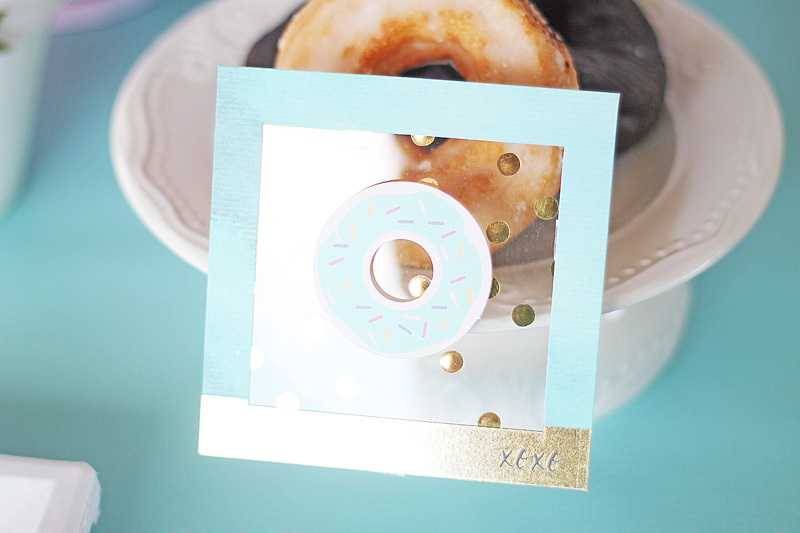 I added a silver foil cardstock circle to the center of each rosette for some extra shine. 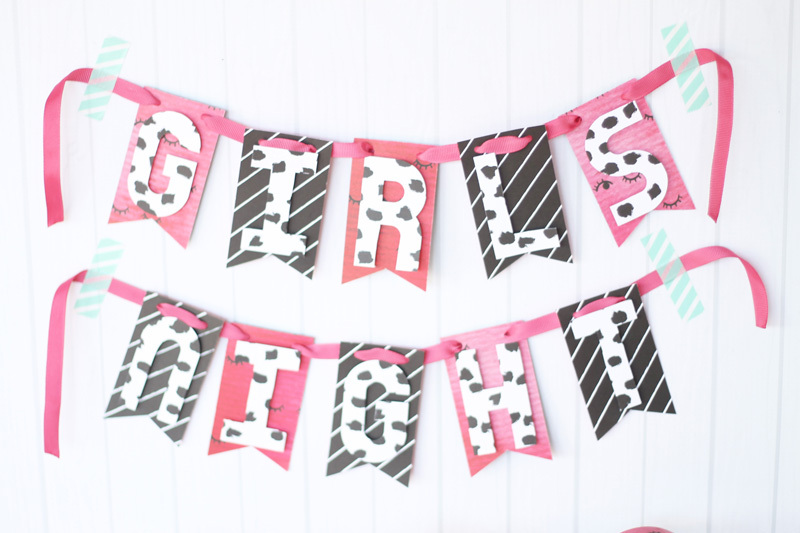 I couldn’t stop at the rosettes, so I made banners, too! 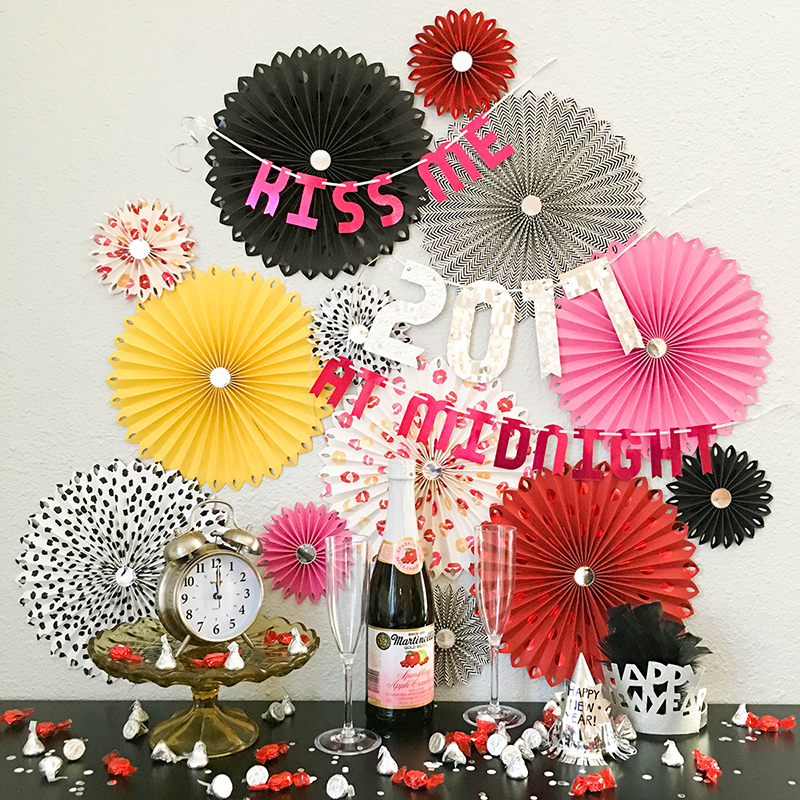 For the “kiss me at midnight” banners, I used a piece of Bazzill pink foil cardstock and the Mini Alphabet Punch Board. I punched each letter according to the directions, and added the decorative notches with the punch board. 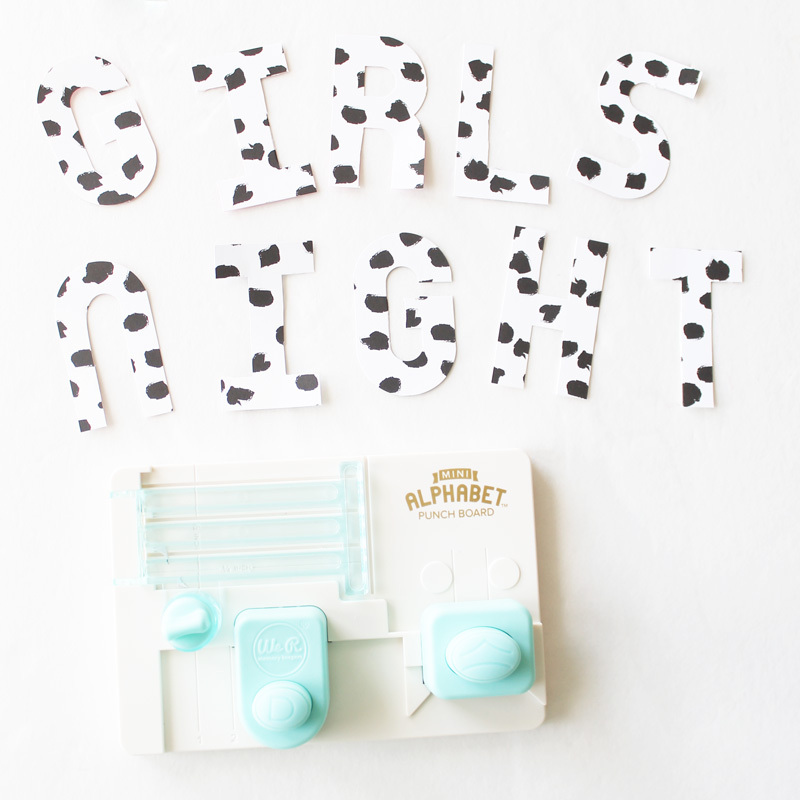 I used my Crop-a-dile to punch two holes in each letter and strung the letters on silver ribbon. 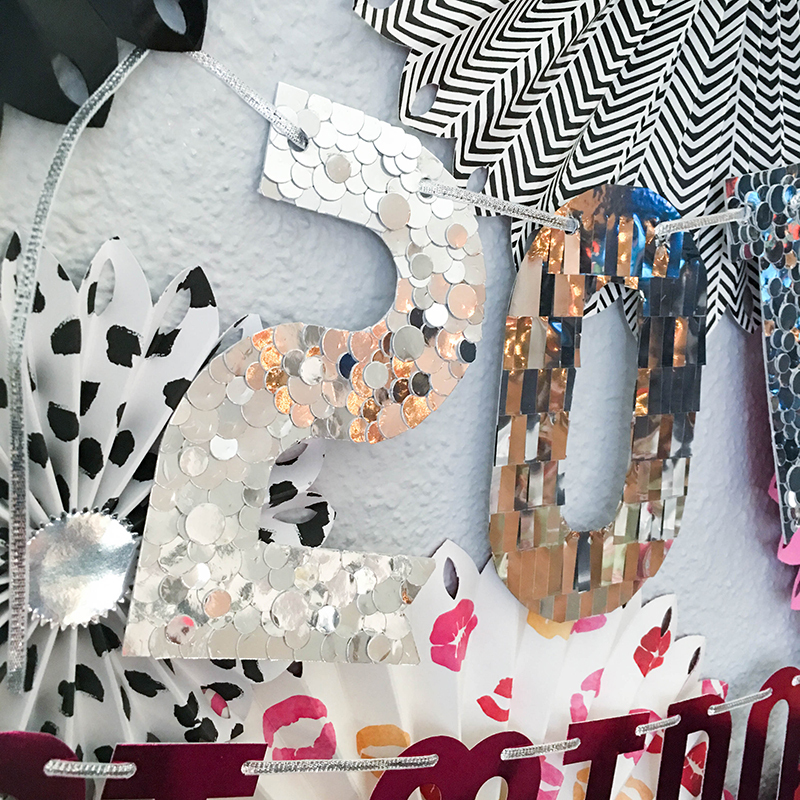 To make the “2017” banner, I used the regular sized Alphabet Punch Board to punch the numbers from plain, white cardstock. 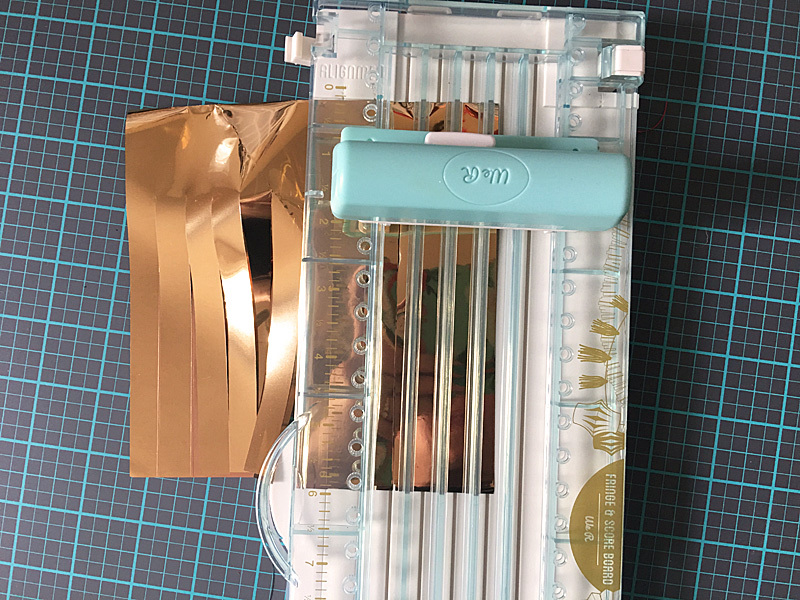 Next, I used the DIY Party Confetti Punch to punch a lot of confetti from the silver foil cardstock that I used earlier. 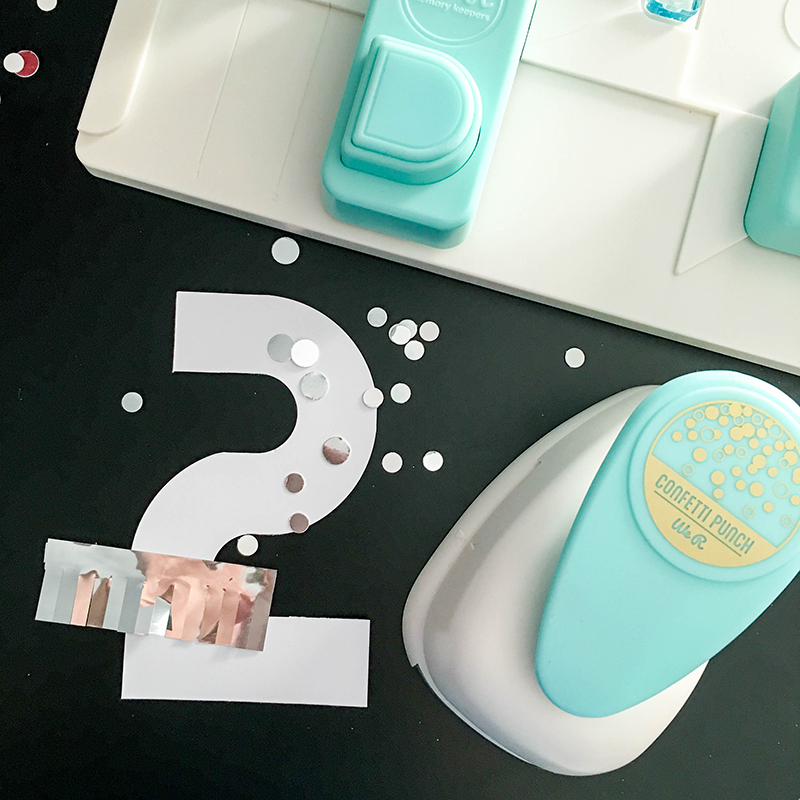 I covered the “2” and “1” with adhesive and placed one little piece of confetti at a time. It took a while, but the mirror ball-like effect was definitely worth it! 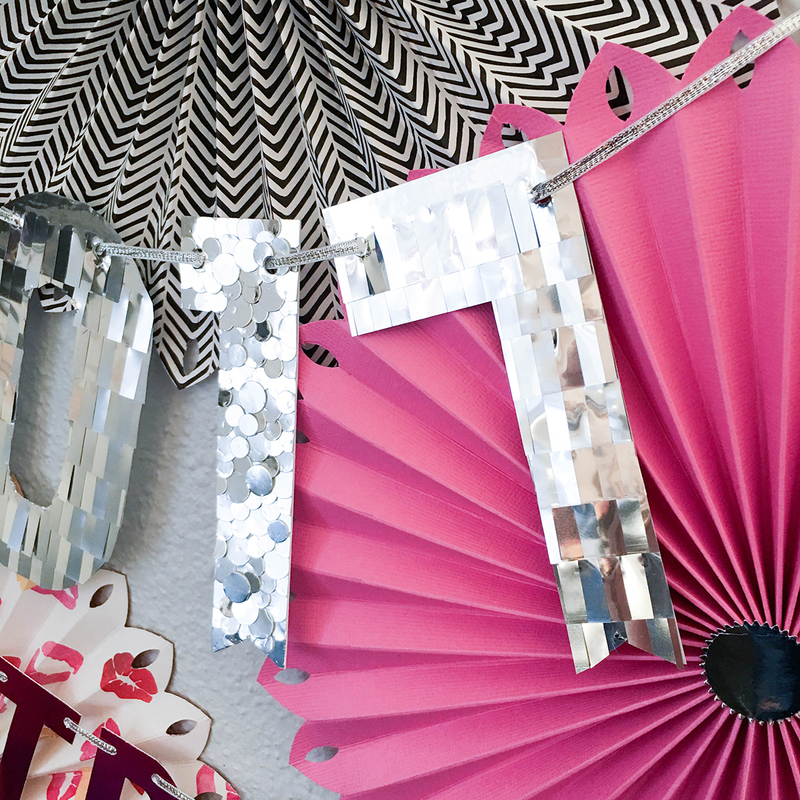 I used DIY Party fringe tape in silver to cover the “0” and the “7”. 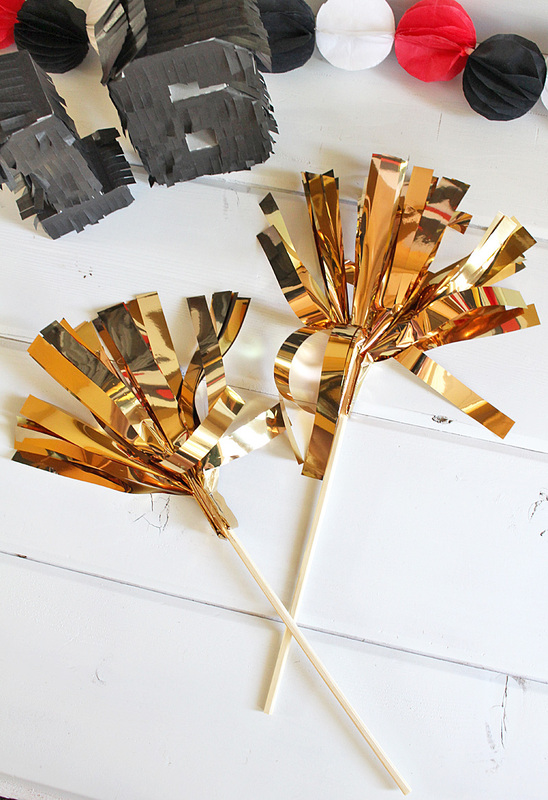 There’s no need to go to the party store for décor when you can make your own! 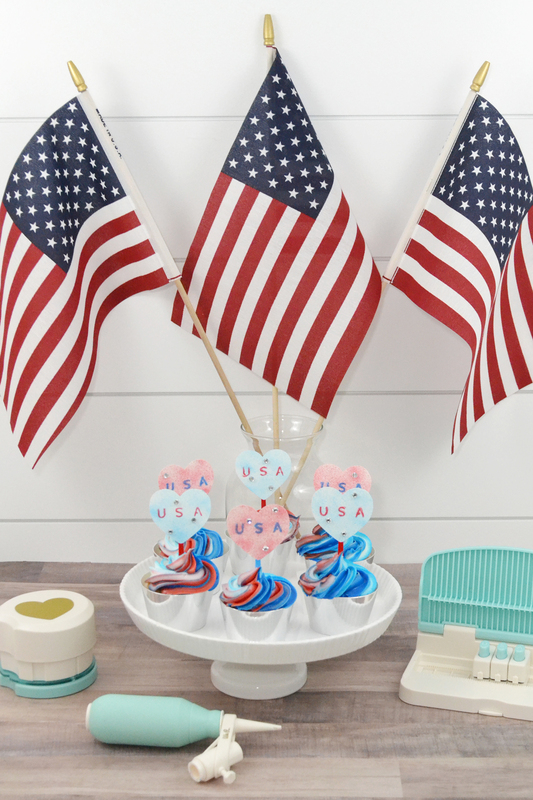 We R Memory Keepers DIY Party tools make it so easy and fun. Happy creating and Happy New Year! 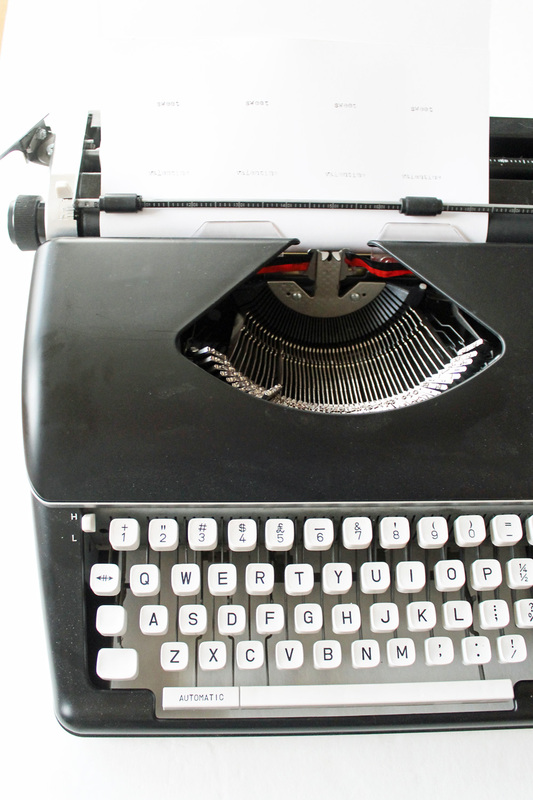 Welcome back to the We R blog! 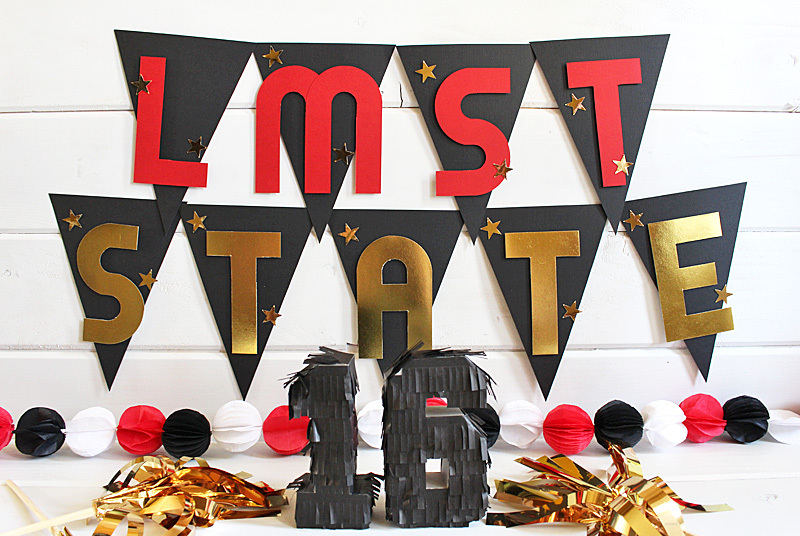 Today Kimberly is up, and she was given the challenge to create a project with a sports theme. Check out what Kimberly created below! Hello We R fans! 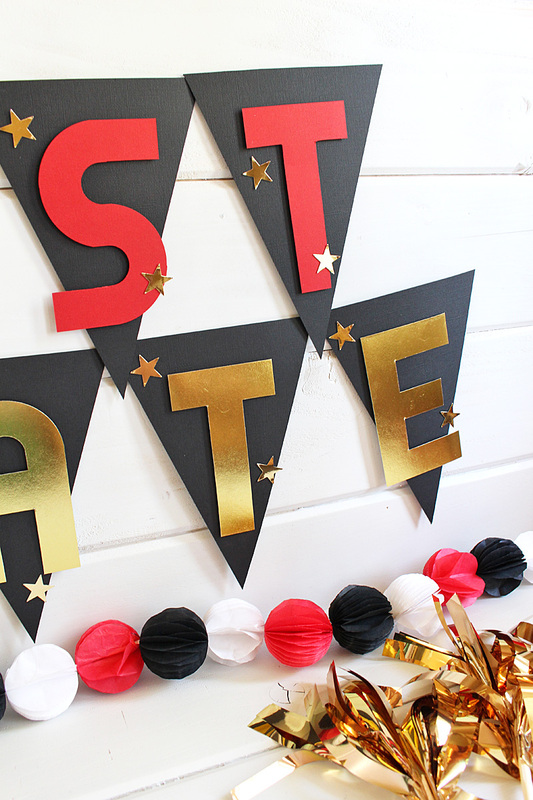 Kimberly here with a set of fun sports-party décor! We are nearing the end of the long course season for swimming and it is time for our team to celebrate those who earned their way to the state level competition! I had a couple of fun ideas, but the more We R Memory Keepers tools I pulled out, the more fun ideas I had! 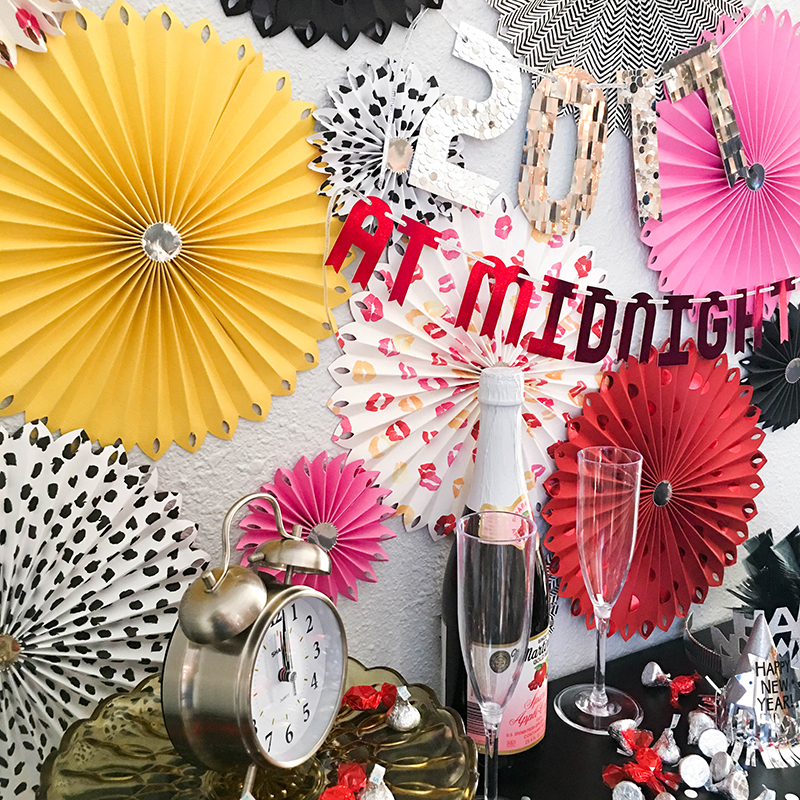 Creating this décor was an absolute blast! 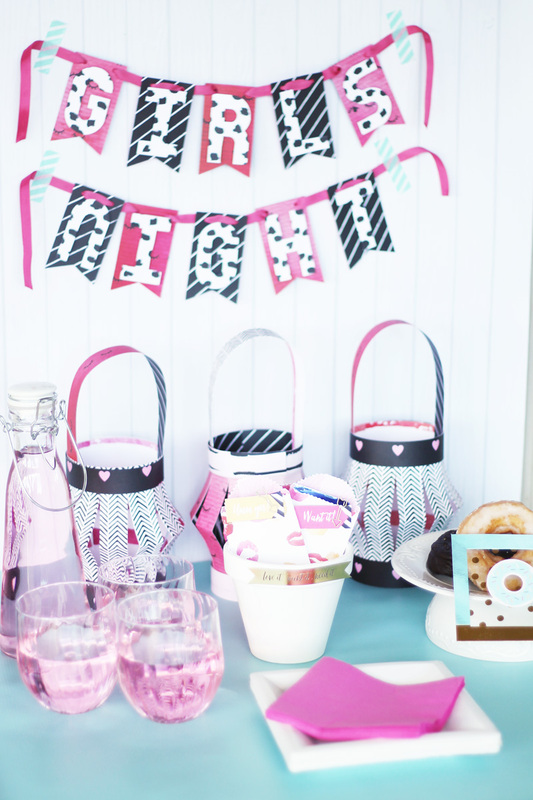 I know you will want to use some of these ideas for your next team party too! To start with, I created this bunting to look like our pool lane lines. The pool lane lines are a large part of life at the pool, and I wondered if I could make something to resemble the lane lines. I thought about the DIY Party Honeycomb and how it makes 3D shapes. 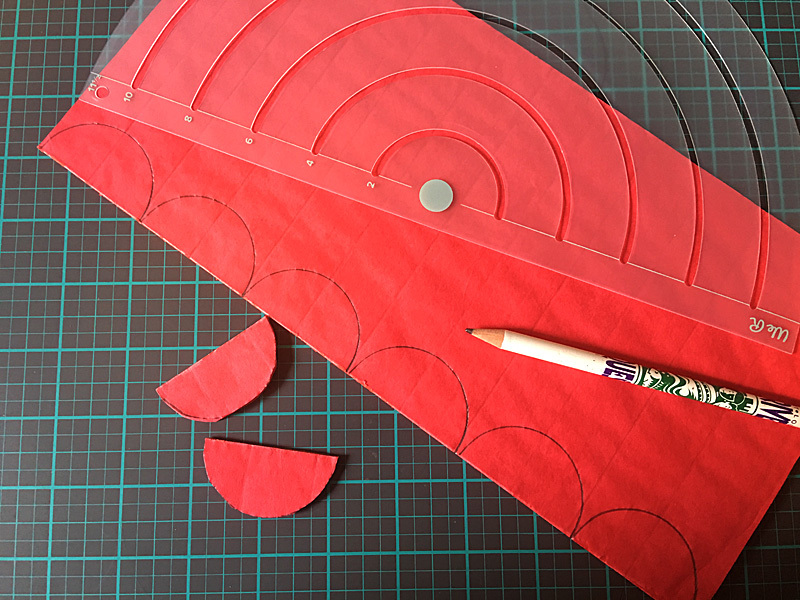 So, using the DIY Party Honeycomb stencils and one pad of the DIY Party Blossom Honeycomb, I traced the smallest circle down the adhered-together side. Then I cut them out with scissors. I repeated the same process for each color of Honeycomb. 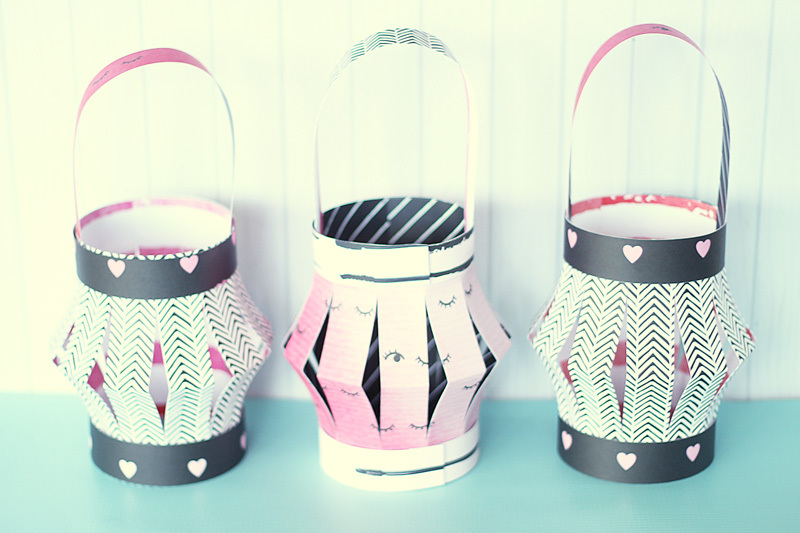 To create the bunting, I grabbed a long piece of DIY Party Raffia and applied liquid glue to side of my honeycomb. 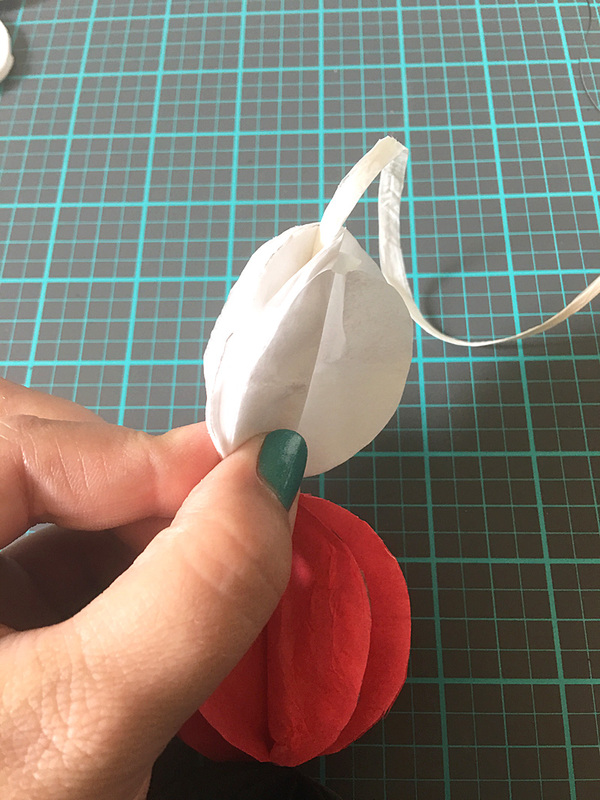 I placed the Raffia in the center, along the fold, and then held the sphere in place for a moment as the glue set. After making a few of these, I quickly learned that it is better to open up the Honeycomb, create the shape, and then adhere the sides together. The Honeycomb opened up more to make the sphere seem fuller. The minute my son saw this, he knew exactly what it was! This bunting will look great hanging on the wall, but I will be making a few more to place down the center of the tables! 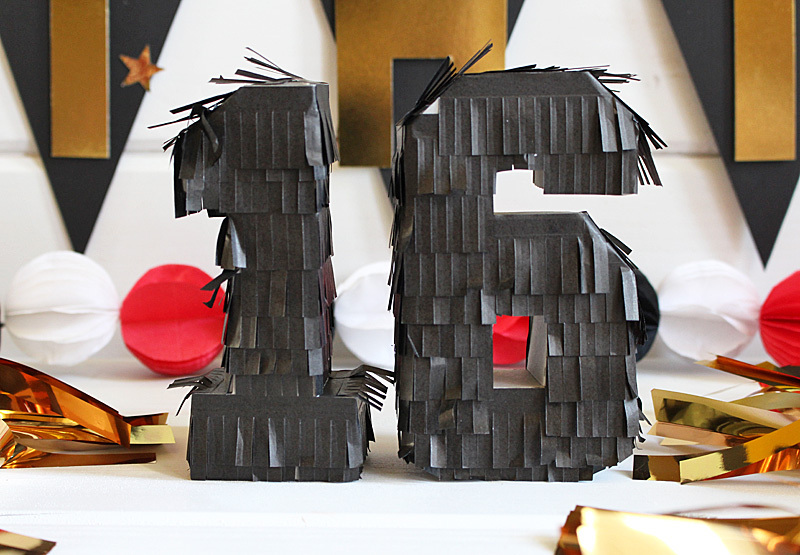 The DIY Party Pinatas made the perfect touch-a way to commemorate the year. I know when we take photos, these will be a fun and festive reminder! 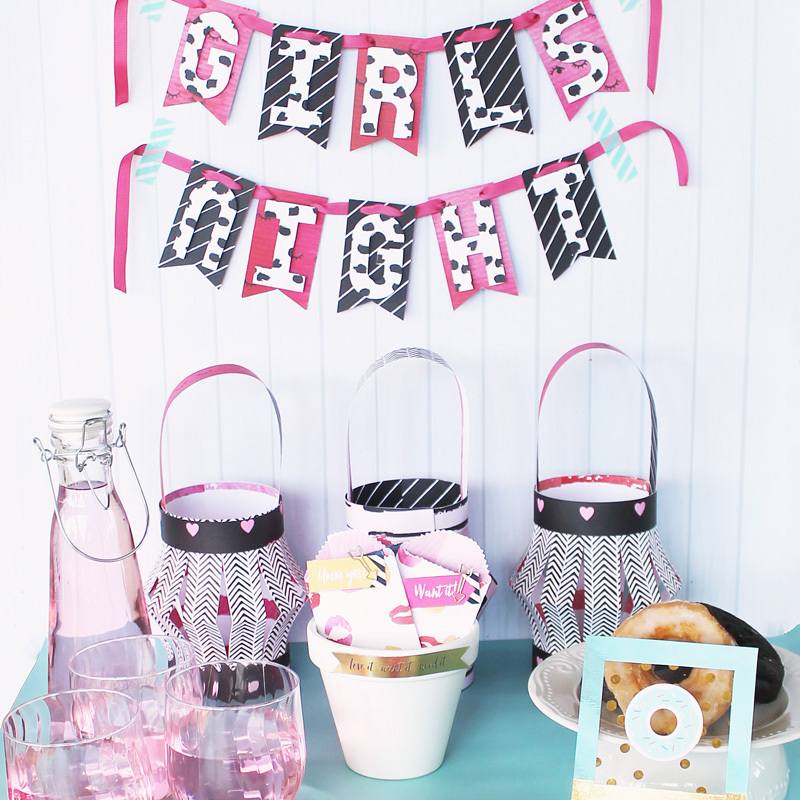 Plus, how fun to include candy inside each piñata at the tables! 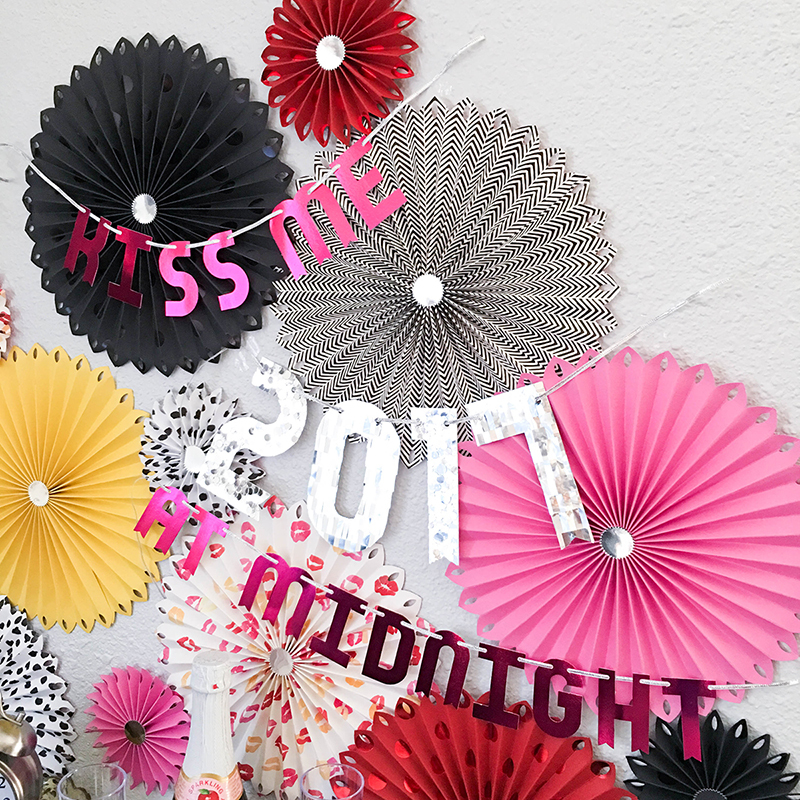 Hands down, my favorite party of the décor are these pompoms! 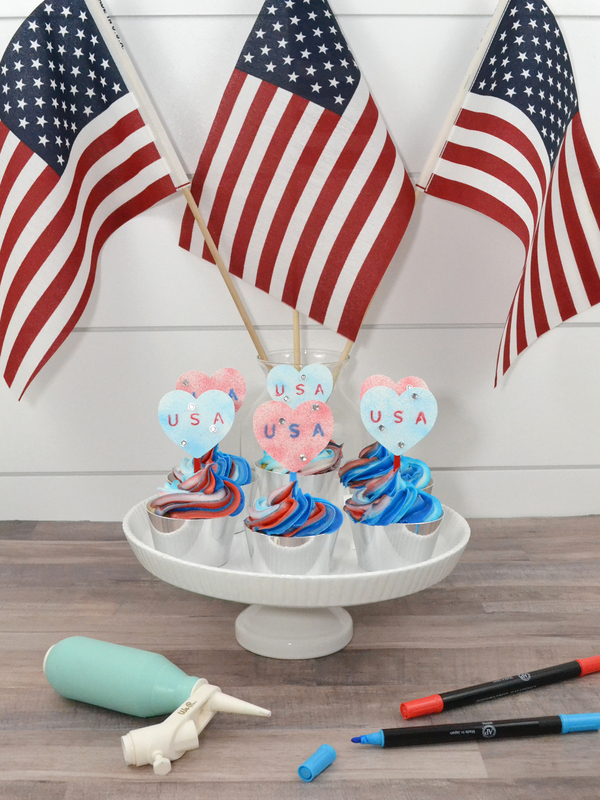 Perfect for the moms and dads to take home and use to cheer on their swimmer at the event! 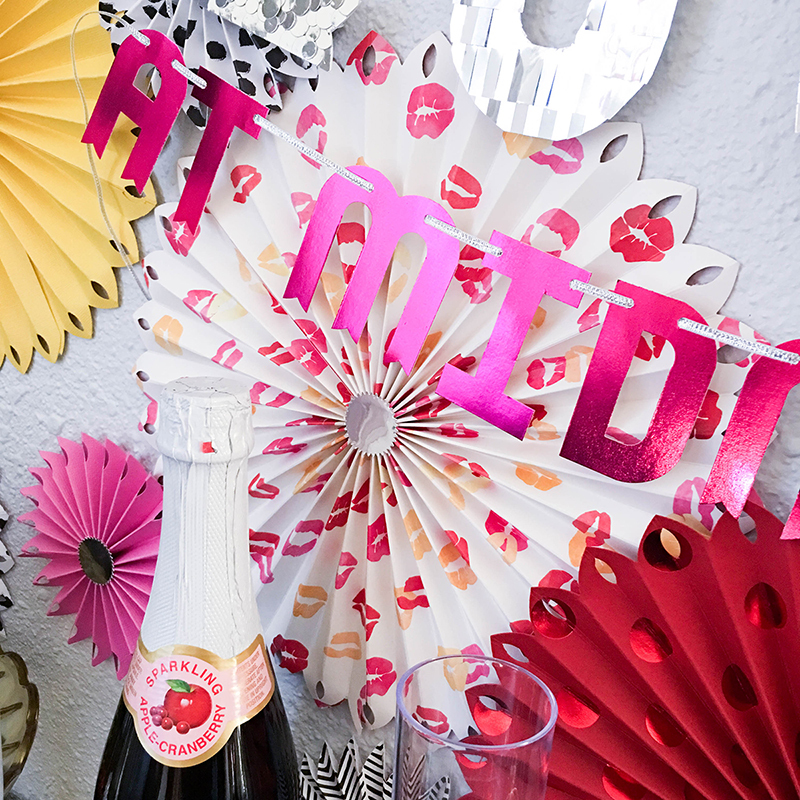 I started with the DIY Party Fringe and Score Board with DIY Party Mylar Paper Pack. After folding the sheet of Mylar in half, I lined everything up, according to the directions. Then I slid the Fringe Tool down the guide. It moves so easy, creating perfectly spaced fringe. Then I removed the Mylar paper, opening it up to lay flat. I rolled at the middle, then folded it in half again. 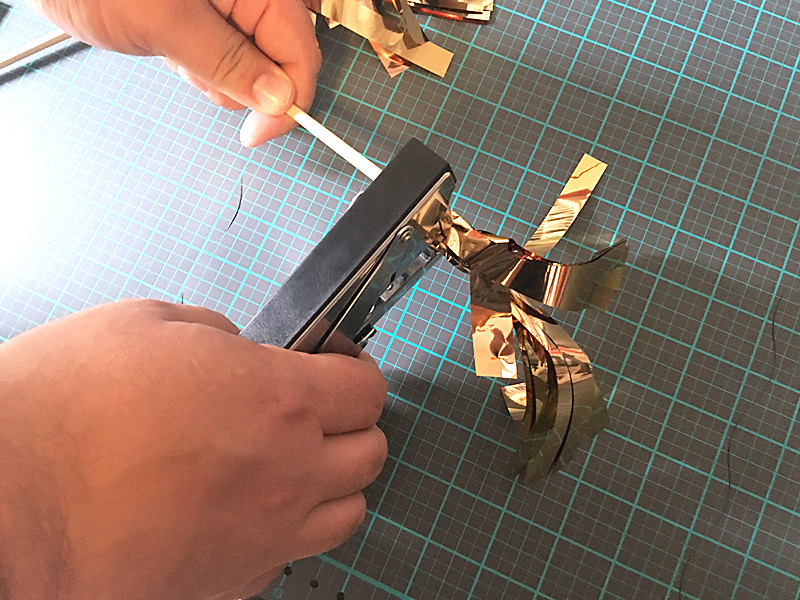 Using an industrial stapler, we adhered one fringe to one side of a chopstick and a second one to the other side. 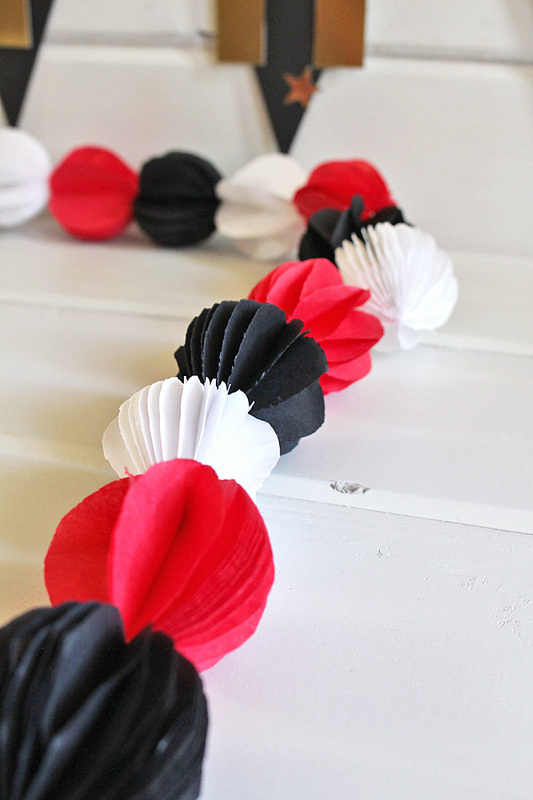 Perfect pompoms! 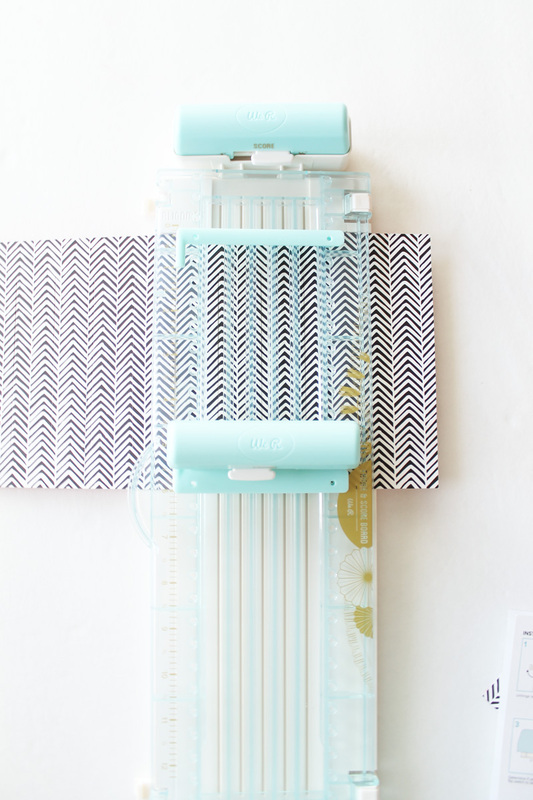 Coolest part is, you could also use tissue paper in the DIY Fringe and Score Board. Imagine the colors you could customize for your team! To finish the entire ensemble off, I created banners using the Banner Punchboard and the Alphabet Punchboard. So much fun to make! It will add so much to our celebration! Go LMST! What does your sports team have to celebrate?